Personalised medicine and renewable energy are just two of the areas where synthetic biology techniques could lead to economic benefits for Scotland. A new report from the Scottish Science Advisory Council suggests the Scottish research base already has significant expertise in synthetic biology and so the country is well placed to capitalise on further opportunities in this area. Synthetic biology is a relatively new technology, combining biology and biological processes with engineering and information technologies. Synthetic biology is a component of genetic modification, and has a wide variety of potential applications. It is made possible by recent developments in genetics and molecular biology, coupled with computer algorithms which allow scientists to model, or predict, with greater precision and predictability how changes in cells and other biological systems could take effect. Synthetic biology also uses advanced computer systems to store, use and manage genetic data. 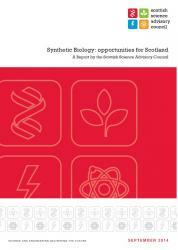 ‘Synthetic Biology: Opportunities for Scotland’ is the result of a year-long examination of research in this area already being done in Scotland, and its potential economic impact. It looked at both the advances in this new technology, and the evidence for and against its development and use, including economic and environmental opportunities and threats. The report notes that most research on synthetic biology currently uses ‘contained systems’, in the laboratory. Contained systems use physical and biological controls to prevent their release into the environment. Using plants to draw heavy metals out of contaminated land. The metals then have potential applications as industrial catalysts or in medicine. Developing a way to use ‘artificial photosynthesis’ to produce methanol and other potential liquid fuels. Simplifying the production process for medicines, reducing their cost; and developing stratified medicines, with drugs able to be customised to address specific patient needs. Using synthetic biological materials as fuels to replace petroleum-based fuel; and potentially generating fuels from waste products.